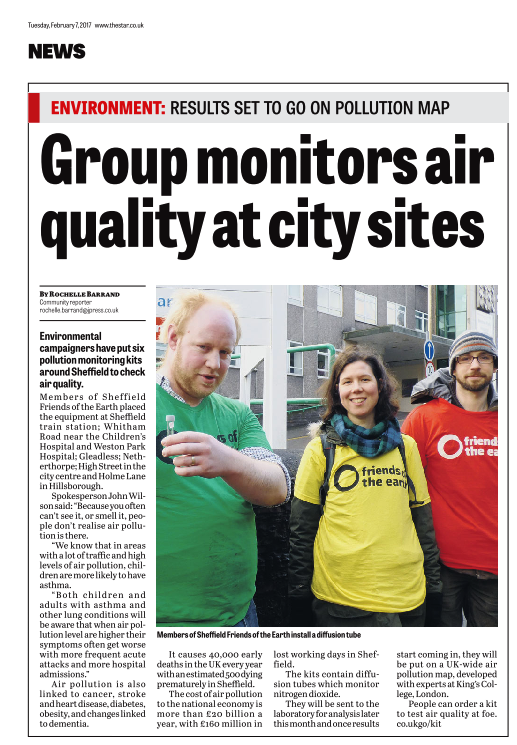 We received good press coverage of the our local air pollution monitoring campaign which involved several members of the group placing 5 diffusion tubes around the city to monitor pollution levels. (see below). Our press release asked the public for suggestions where the second batch of monitoring tubes could be placed. The Star's article didn't mention this so we are now going to place most of the second batch were there are currently gaps in in monitoring around Sheffield. This will be based on Sheffield City Council's air pollution digital monitoring map. We agreed that a tube from the second batch would be saved so we could place it out side Radio Sheffield's studio. Aaron will contact the radio station to see if he can arrange an interview, ideally when the results from the first batch are available. A letter from Louise Haigh MP to Richard focuses on the need for a national framework and enforcement mechanisms since national consultation on clean air zones (and using information from British Lung Foundation). We agreed that whilst we had shared campaigning interests with the Green Party, as a non-party political group, we could not directly endorse their specific campaign and it would be better to work together under Sheffield Climate alliance, for example. Positive “quick win” activities could be generated and shared with national Friends of the Earth. For example, getting motorists to “Beep if you want to go electric” or could use an app generated by Festival of Debate team to highlight poor air quality. The Clean Air campaign day of action is 24th June and we need to think about ideas for a stunt. As part of this spring's Festival of Debate we are planning to host a panel with Medact on air pollution with, hopefully, Prof Jeremy Wight in May. We still need other/additional panel members. Aaron to contact Radio Sheffield re interview ideally when results available. All to consider ideas for quick win actions. Richard and Aaron to further investigate their specific ideas. Aaron organising FoD event and contacting other potential panel members – suggestions please.